Laissez le bon temps rouler! – Let the good times roll!! Bourbon Street in Denver!! 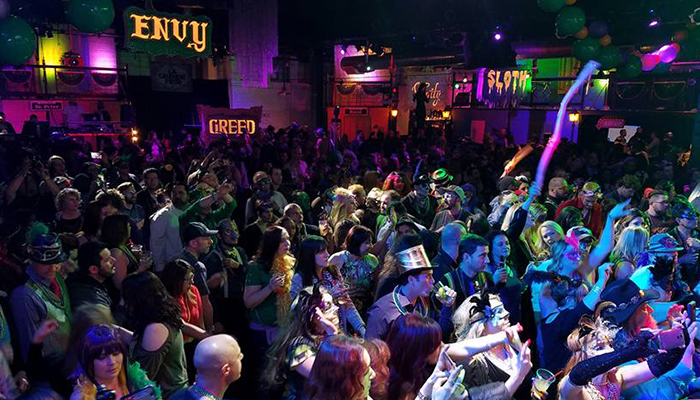 Join 2,000 friends for Mardi Gras, 7 Deadly Sins. Wander around the street and collect beads with your Hurricane drink. Bourbon street is being created for your enjoyment inside Exdo event center and Tracks Nightclub. Festival: 2,000 people, 10,000+ free beads, 32,000 sq ft of Bourbon Street! Visuals: 32 foot Video Stage, 40 foot Video Wall. Creating 14 foot buildings with full balconies and hidden courtyards. 12′ voodoo dolls. Various booths with interaction. Decor, Decor, Decor. Music: Live bands: Rowdy Shadehouse, and Brass Bands. Multiple DJ’s. Spinning Zydeco, hip-hop, dance hits, and Mardi Gras favorites. Entertainment: Mardi Gras Parade. Party float, brass bands, drum major and you! Rowdy Shade House Live! Models tossing beads from balconies. Party Panda, Ally Alligator and Dancing Heads will be at the event! Balloon tying, jesters, drum leaders, aerialists, dancers, burlesque, face painters, tarot readers, magicians, jugglers and more. Drag Troops, Drag Queens, Drag Burlesque. Party Boys. Chateau kittens, Lifestyle lounge meet and greet, confession booth. ATTIRE: Get in the spirit and come in costume! Masks encouraged! Gold, Purple & Green are traditional Mardi Gras colors! Costumes are not mandatory, however dress to impress! The US is set to ban soaps, body washes, and toothpastes containing this harmful ingredient….